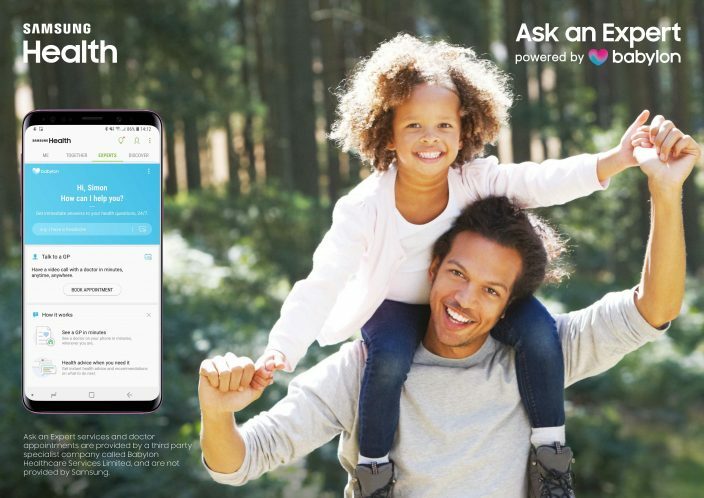 Samsung and Babylon Introduce ‘Ask an Expert, powered by Babylon’ to Offer Live Video Doctor Appointments and Symptom Checker – Samsung Newsroom U.K.
London, UK – 31 May 2018 – Samsung has partnered with digital healthcare provider Babylon to launch ‘Ask an Expert, powered by Babylon’, a pioneering system that allows users to check symptoms and book live video doctor appointments. The Babylon service will be made available within the Samsung Health app on compatible Samsung Galaxy mobile devices. Living a busy life can be time-consuming and checking up on health and well-being can often be at the bottom of the priority list. For those with hectic schedules who don’t have time to visit the local doctor, ‘Ask an Expert, powered by Babylon’ offers the perfect solution. By incorporating Babylon’s artificial intelligence (AI) service within the Samsung Health app, users can book video appointments with certified doctors 24/7 to obtain medical advice, manage and order prescriptions online. The service will make checking up on health seamlessly integrated into everyday life, whether at work, home or even on holiday. Users can also check their symptoms and receive high-quality triage information about physical health, common ailments and symptoms straight to their device. The system draws on 500 million streams of knowledge to provide near-instant health information, meaning ‘Ask an Expert, powered by Babylon’ offers a readily-available source of advice at your fingertips. ‘Ask an Expert, powered by Babylon’ will be available within the Samsung Health app for users in the UK from 31st May 2018. Full membership with access to unlimited appointments with Babylon doctors will cost just £50/€50 per year, on an annual subscription basis, or £25/€25 for a one-off appointment. Babylon’s mission is to put an accessible and affordable health service in the hands of every person on earth. Babylon uses a combination of cutting-edge technology and the best available medical expertise to deliver 24-hours-a-day, 7-days-a-week access to digital health tools (including health assessment, triage and medical information tools), to people across Europe, North America, Asia, the Middle East and Africa, as well as video doctor consultations.